Was that a moth flitting across the yard? Look closer, that little gray flutterer just may be a hairstreak (Theclinae) butterfly. 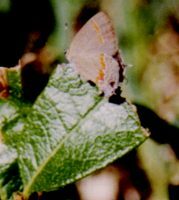 The butterfly pictured here is a Red-banded hairstreak (Calycopis cecrops) perched on an oak leaf. Red-banded hairstreaks are found throughout Florida, usually in open areas and along woodland edges. They're small, with a wingspan of only 0.75-1", and tend to stay hidden unless disturbed. They rest and bask with their wings closed. They breed year round in Florida and lay their dimpled white eggs in leaf litter below host plants. When they hatch the caterpillars are pale yellow. As they age, they darken. The caterpillars are covered with brown hairs and have a blue green stripe down their backs. They feed on oaks, crotons, and wax myrtles. The chrysalids are brown with black mottling. Adults sip mud and are attracted to the nectar of the host plants as well as dogbanes, milkweeds, wild cherry, and sweet pepperbush.